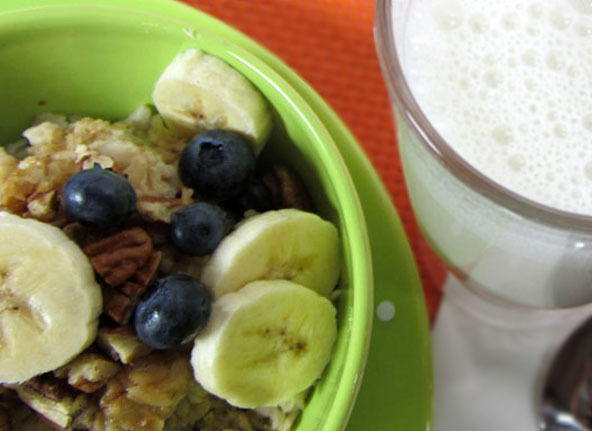 Oatmeal doesn’t have to be so boring. Start adding in some of your favorite goodies or eat them on the side. Try this recipe for starters. In a small pot, add the water, oatmeal and raisins and/or applesauce/apple if using and bring to a boil. Add a dash of Himalayan salt and chia seeds if using. Reduce heat and simmer for about 5-6 minutes. Serve with sliced bananas and maple syrup or Wholetarian Syrup Blend. You may want to pour homemade Banana Nut Milk or Coconut Milk on top.